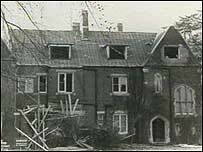 Grants Hill House in Uckfield, East Sussex was the place of the last confirmed sighting, in 1974, of perhaps this county’s most famous disappeared person, John Bingham. He arrived at the home of his friends Ian and Susan Maxwell-Scott, on Thursday 7th November, in a dishevelled and bloodstained state. Only Susan was at home to hear Bingham tell a distressing tale of how he had been walking past his estranged wife’s home in London’s Belgravia and had seen her, through the window, struggling with a man in the basement kitchen. He had scared the intruder off only to discover the bloody murder of his children’s nanny. He had tried to calm his wife but she had run into the street crying, “Murder!” Deciding that the scene reflected badly on him, he had fled. Bingham was, of course, better known as Lord Lucan and his account of events was a complete fabrication. Despite a long campaign to portray his wife as mentally ill and an unfit mother, Lucan had lost custody of the children to her in an acrimonious court case the previous year. It was he who had murdered the nanny, Sandra Rivett, mistaking her for his wife in the dark. He had then violently attacked Lady Lucan but she had put up a fight and escaped to a nearby pub to raise the alarm. He had driven, in a borrowed car, to East Sussex. Having arrived at Grants Hill House at a late hour, Lucan could not be persuaded by Maxwell-Scott to stay the night and go to the local police in the morning. Instead, he drove away in the early hours saying that he had to get back to London. He did not arrive and the car was found three days later, abandoned in the Sussex port of Newhaven; Lucan was never seen again. He was declared dead in 1999 and a certificate was finally issued last year. There were countless theories and unconfirmed sightings before then: he jumped from a cross-channel ferry; he flew to France from a Kentish airfield; he lived out his days in the southern African country of Mozambique. However, there is one theory that places Lucan’s demise closer to home. In the late 1990s, Sussex police received a series of anonymous phone calls from someone who said they had been in the grounds of Grants Hill House on the night of 7th November 1974. The witness claimed to have seen two men shoot a third and dump his body in a cesspit. The caller refused to make a proper statement and the information was not acted upon. As the house had been demolished and the grounds redeveloped in the 1980s, a search for remains would have been difficult; but it might be that Grants Hill House is not only the place of Lucan’s last sighting, but his last resting place.